Vijaya Bank Manager Result 2018 Check Here. Vijaya Bank Manager Admit Card 2018 Check Here. Vijaya Bank Notification is out. 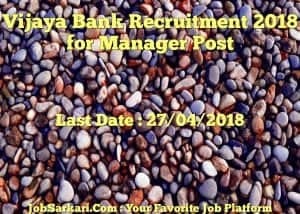 Vijaya Bank is recruiting for 57 Manager 2018 Posts. You can check Vijaya Bank - Vijaya Bank last date, download Vijaya Bank notification, visit Vijaya Bank official website and check other Vijaya Bank Vacancy details.Complete Vacancy and recruitment Details about 57 Manager 2018 vacancies in Vijaya Bank are provided below by JobSarkari.Com only for you. Last Date for Apply Online 27/04/2018. Last Date for Receipt of Hard Copy of Application form 04/05/2018. Last Date for Receipt of Hard Copy of Application form (From far flung Areas) 11/05/2018. experience as Chartered Accountant. 17 08 05 02 32. 11 06 03 01 21.
identical rank in Paramilitary forces with 5 years service. 03 01 00 00 04. Total No of Post 31 15 08 03 57. Accountant 20 Years. 35 Years. 3. Candidate are Require to Register for Applying for the Post. 6. Take the printout of your Application form for Future Reference. 7. Online Application can be Submitted on or before 27th April 2018. Q. What is the Last Date For Vijaya Bank Manager 2018 Vacancy ? A. Last Date for Vijaya Bank Manager 2018 Posts is 27/04/2018. Q. What is the Form Type of Vijaya Bank Manager 2018 Recruitment ? A. The Form Type for Vijaya Bank Manager 2018 Posts is Online. Q. 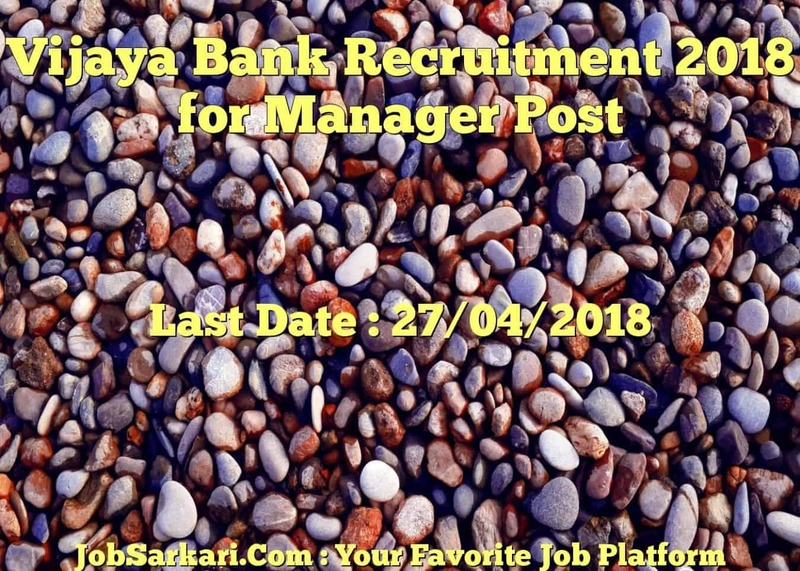 How many vacancies are available in Vijaya Bank Manager 2018 Posts ? A. There are about 60 Vacancies in Vijaya Bank Manager 2018 Posts. Q. What is the Full Form of Vijaya Bank ? A. Full Form of Vijaya Bank is Vijaya Bank .